This entry was posted in 2017 Las Vegas mass shooting, conspiracy, deep state, False flag and tagged gun confiscation, white gunman to disarm america. Bookmark the permalink. Yeah, I’m just starting to gather information on this. They have ALREADY had a motorcade for the slain policeman. Have you ever heard of such a thing? I haven’t. All the Demon-Rats are howling about being in charge and guns control. Right on cue. People not even cold in their graves. This smells like a fish market. The ‘Press” keep calling it LA. It is eighty miles North of LA. Just more crap. The reason I mention it is as an example of how they just read the script the CIA hands them. Right now “The Talk” on CBS is calling for gun control and disarming Americans… Does not take long does it…. California already has draconian laws about magazine capacity. Doesn’t look like they work too well. This is a little too close to “Hollywood”, figuratively and literally. All the reports I’ve read read alike. They claim people were hiding in the “attic”. Really? Got that Lee Harvey Oswald look, to me. Another Hellywood central casting shooting. I’ll believe it only with good evidence. 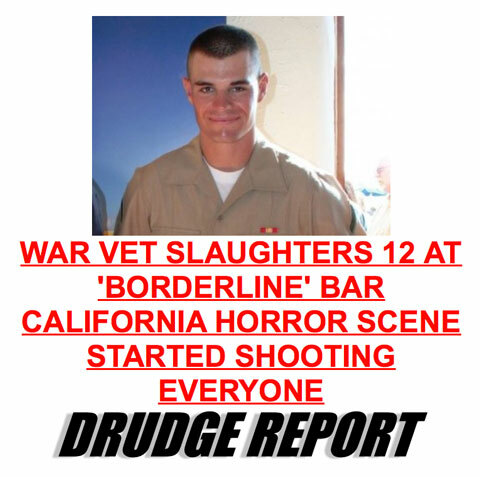 And what do you know…the Marine was “known” to authorities. These things are conspicuous,if for no other reason than the timing. How ironic that this particular event happens RIGHT AFTER THE MID-TERMS? BTW-Be forewarned-Nevada now has a “governor” (no caps,as with alleged president obama,a sign of disrespect) ,a senator,wacky Jackie Rosen,and a Washoe County Sheriff who all fully supports Gun Control AND CONFISCATION. I’m expecting,until AMERICANS can change the power structure,Nevada will be “California Jr.” (I don’t like it,and reserve the RIGHT to refuse,as an AMERICAN,to comply to anything UNCONSTITUTIONAL they might enact. No matter who controls the house band in Mordor on the Potomac, open borders, disarming of deplorable kulaks and the smart grid control matrix will happen whether we like it or not. Use the time that Trump is buying us wisely.